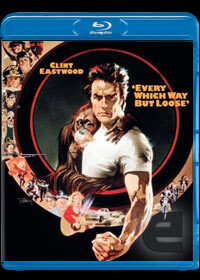 I'm a sucker for buddy movies and Every Which Way But Loose is truly one of the most memorable of these movies thanks to "tough guy" Clint Eastwood and his partner in crime, Clyde the orangutan. That's right, Clint's co-star is a prime mate in this entertaining action comedy that throws together a variety of stereotypes from the 1970's. It's amazing that Every Which Way But Loose is over 30 years old and best of all, the story and dialogue still holds up quite well even today. Director James Fargo cleverly adds all facets of story writing into this movie from comedy, action, drama, romance and even conflict between the stars that helped define the word "hick". The story itself involves Phil Beddoe (Eastwood), a tough and dangerous trucker who happens to live with his mother (Ruth Gordon) and their pet orangutan named Clyde. Both Beddoe and Clyde have a strong friendship who often drink beers together and get involved in a variety of comedic diabolical plots and to compound the situation, Beddo's mother does not approve of her son's new love interest who is played by the talented Sandra Locke. From angry mothers to dangerous gangs, Beddoe has Clyde watching his back as together they make a formidable force in this hilarious clichéd and over the top comedy. The video and audio quality has been successfully transferred onto Blu-ray that does look better than the DVD version, however the movie is beginning to show its age through the quality. Warner Bros have done a great job at transferring it to high definition that contains vibrant colours and good sound. The unfortunate aspect of this film is the lack of special features and to conclude, all I can is bring on the sequel. Although rated M15+, this movie could almost be watched by the whole family!